Customer convenience and added value is key to promoting paper turn-off, so offering customers a better experience than the paper alternative is the first step. Sending electronic documents continues to deliver operational savings for companies by reducing costs associated with print and postage. But many are experiencing low paper to paperless adoption rates. Michelle van den Berg, Head of eBilling at Striata SA, explores what drives paper turnoff and why conversion rates are not as they could be. 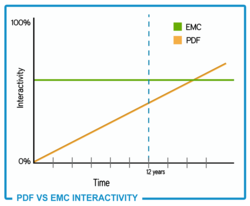 According to Van den Berg, 2014 will see the convergence between PDF and the interactive functionality that is offered through the EMC format. “The result will be a fully interactive electronic document, but without the need for a proprietary reader download. We envisage that it will take another 12-18 months for the PDF format to offer all the functionality currently possible inside an EMC. Once this convergence takes place, the result will be rich functionality packaged in a globally ubiquitous format."